March 21 has been observed as World Down syndrome day through out the nations. The date itself has been selected for very clever reasons; it is held on the 21st day of the 3rd month, which is a hat-tip to the uniqueness of the triplication of the 21st chromosome which leads to Down syndrome. Adequate accesses to health care, to early intervention programmes and to inclusive education, as well as appropriate research, are vital to the growth and development of the individual. In December 2011, the General Assembly declared 21 March as World Down Syndrome Day. The General Assembly decided, with effect from 2012, to observe World Down Syndrome Day on 21 March each year, and Invites all Member States, relevant organizations of the United Nations system and other international organizations, as well as civil society, including non-governmental organizations and the private sector, to observe World Down Syndrome Day in an appropriate manner, in order to raise public awareness of Down syndrome. Leave no one behind: All people with Down syndrome must have opportunities to live fulfilling lives, included on a full and equal basis with others, in all aspects of society. 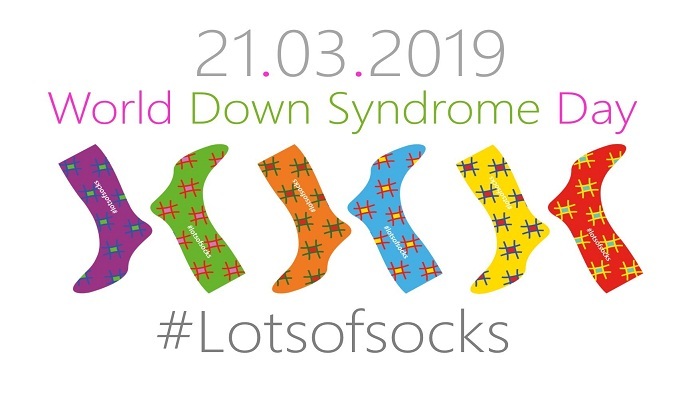 Let’s get people talking about WDSD on 21 March 2019…wear our official #LotsOfSocks socks, other brightly coloured socks, long socks, printed socks, 1 sock… even 3 socks for 3 chromosomes. If you do not normally wear socks, then wear them. And why stop at socks? Wear our #LotsOfSocks t-shirts, WDSD t-shirts and other brightly coloured clothing.